Imagine traveling around the world and visiting your bucket list destinations with no worries. Think of all the fresh experiences you can get by flying to uncharted territories. Well, dreams come true as Cebu Pacific and GetGo continue to surprise Filipinos with more than just exciting new routes and low fares. 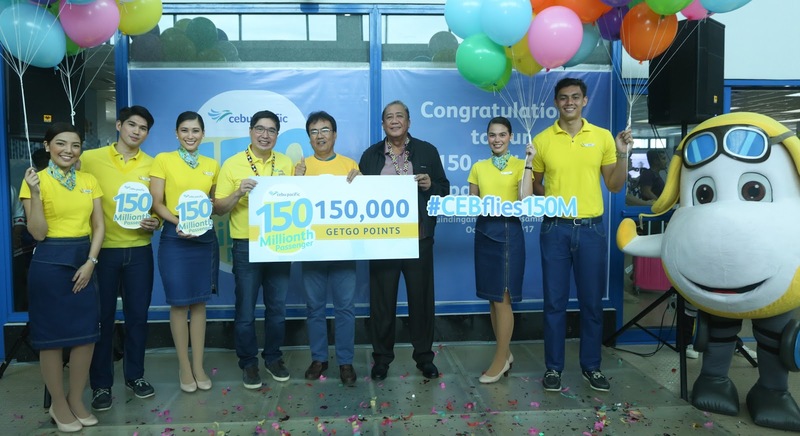 As gratitude to the people who believed and flew with the airline from the start, Cebu Pacific and GetGo rewarded its 150 millionth passenger with 150,000 GetGo points for free flights. That’s enough points to fly around the world to experience amazing holidays and vacation getaways! With thousands of GetGo points, you can surely create countless memories with friends and loved ones. Here are some destinations that you can fly to for a year of adventures! Alfredo Cruz (fifth from left), Cebu Pacific’s 150 millionth passenger, receives a surprise of free flights with 150,000 GetGo points from Lance Gokongwei (fourth from left) and Transportation Secretary Arthur Tugade (sixth from left). Welcome an adventure-filled year with an unforgettable experience at the New Year’s Eve capital of the world. Along Sydney Harbor’s beautiful shores, you can join excited onlookers as they wait for the spectacle of colorful fireworks and lively music when the clock strikes twelve. Drop by the Sydney Opera House and get front row seats to an Opera Gala featuring local artists and musicians. You can also go on a cruise with great food while enjoying the stunning 360-degree view of the city nightscape as you wait for the New Year celebrations. Fall in love with the breathtaking scene of cherry blossoms at the heart of Japan. Springtime in Tokyo is the best season to visit as you can witness the beautiful sakura in full bloom on streets, parks, and even riversides. You can also go to yozakura, a night-time sakura viewing event, where you can see the charm of the flowers in the dark. Spring is also popular for festivals like Sanja Matsuri, Tokyo’s largest and wildest festival, where tourists can participate and enjoy with the locals. 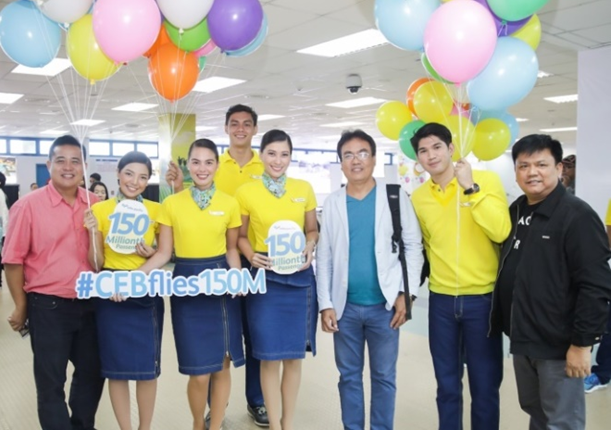 All smiles: Cebu Pacific’s friendly cabin crew gives a warm welcome to its 150 millionth traveler. Bask in the tropical sunlight and take pleasure in the exquisite white sand beaches of Guam. Summer is an ideal time to fly to Guam as its environment provides an exciting opportunity for water activities such as surfing, scuba diving, parasailing, and jet skiing. Nightlife in Guam is also one of the things that you should look forward to when you visit. You can buy locally made souvenirs at the Chamorro Village Wednesday Night Market or you can dance the night away at bars and clubs at Tumon Village. More than just being home to many night markets, Taiwan is also known for its captivating sceneries of maple trees. The autumn season, which falls on September to November, is an ideal time to visit Taiwan as its cool, chilly weather makes for a great hiking experience in the mountains. You can go to Manapan Mountain Trail to breathe in fresh air and admire the fascinating landscape of colors of the maple leaves and autumn flowers. You can also plan a trip to a local hot spring to escape the island’s cold breeze. Winter in South Korea may be harsh, but it does not stop residents from having a good time and celebrating a memorable White Christmas. Bright, vibrant lights cover the streets and Christmas carols fill the air of Seoul. Malls and theme parks are decorated with unique ornaments to keep the Christmas spirit alive. Throughout the bustling city, you can enjoy lively performances, festivals, and parades for a Christmas to remember. You can also try ice fishing in Pyeongchang, ice skating in Yeouido, sledding in Everland, or skiing at Gyeonggi-do. Indeed, GetGo makes traveling more exciting with its rewarding points that take you to places you have never been before! So where would you go with 150,000 points? Share your thoughts with us on GetGoPH’s official pages on Facebook, Twitter and Instagram. For more information on memberships and partners, visit www.getgo.com.ph, or call +632 71-GETGO (43846). Xiaolongbao Day is coming up!